I'm not really a Starbucks fan, but I do have a Starbucks cup in my cupboard from one Christmas when my brother in Seattle sent me a gift pack containing 2 kinds of coffee stuffed into this big green cup. The coffee wasn't bad, but when I go out for coffee now, I go the the coffee nazi shop, so's I can get one of those killer bagels with my espresso. But since I do get a lot of folx searching for Starbuck's information, here's some. Starbucks Drinks Simplified - ever wonder what the heck those drinks are? Starbucks nutrition info - Find the calories, fat content, vitamins, etc. for your favorite Starbucks drinks. Yer basic grande caramel frozen frappuccino is 430 calories! Small, Medium, Large - a link I posted once before that's just too funny. Visit Star-Schmucks but be careful how you order. Well, this is one I won't be trying to grow at home. 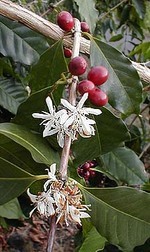 I would love to try to grow a coffee tree, just for the flower / scent alone. Tea is a definite possibility for growing at home, although in my part of the world it might require some special care and protection from the heat. 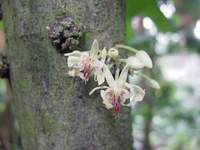 But the chocolate tree, or rather, Theobroma Cacao, is one of the oddest and most persnickety plants around. Cacao is a finicky plant. It has exacting moisture, temperature, and soil requirements, and falls victim to many insect pests and fungal diseases. For this reason, the plant was an unlikely candidate to coax out of the rain forest and into a plantation setting. It grows best in places where rain falls year round and the air is warm and humid. Accustomed to the shelter of the rainforest, cacao trees do not tolerate wind and need well-drained but moist, deep soils. That rules out my back yard. Theobroma Cacao ("food of gods", theo=god, bromine/brosis=food) does best in certain areas of the world, and probably should have been left to grow wild. But we've taken it from it's natural state and made it into a domesticated plantation creature, and according to some of the experts, that may have contributed to the problems the cacao trees are having now. According to Allen Young's studies, crowded plantation life is part of the problem, and breeding is another. "Young found that selective breeding of domesticated cacao trees inadvertently altered the flower's smell, making it less desirable to nearby midges." The upshot is that the insects that would normally help in pollination ... aren't doing their job. That means that though hundreds of flowers bloom on each tree each year, only a handful become the seed pods that we turn into chocolate. I sure hope we resolve this problem. I can't imagine a world without chocolate. It's an odd looking thing, the cacao tree. The flowers are pretty, very intricately shaped, white and pinkish, about the size of a golf ball, but they bloom right off the trunk, what's called cauliflory in the world of botanists which I've been traveling the last few days. As they grow, assuming they've been pollinated, they turn into these giant pods that remind me of something from an old horror film (Invasion of the Body Snatchers?). It's a wonder that we ever figured out how to make chocolate from this odd looking thing. But then, we're ingenious, we human beings, and especially when it comes to getting our pleasures from the things we ingest. The blooms, white and fragrant, appear in the fall. How fragrant are they? Dunno. I guess I'll have to try to grow some of my own to see. I found an excellent article on about.com: Growing Tea at Home, and some additional planting/growing tips here, and here. We mostly are accustomed to using the leaves of the tea plant to make our tea. 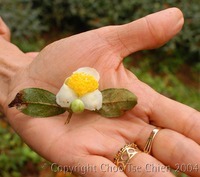 But you can also buy special teas made with the tea flower, and enriched with the flowers' pollen. "Additional health qualities are attributed to them. The flowers are also used to add a pleasant flavor to other green Puer teas. Just break a bit and add it to the pot of green tea to experience its mellowing effect." This is the first of a three-parter, all about the plants and flowers that become the stuff we love: coffee, tea, and chocolate. First: coffee. I am a huge lover of flowers, the more fragrant the better. The coffee flower is said to smell like jasmine. If that's true, the middle of a coffee planation would be a little slice of heaven for me. 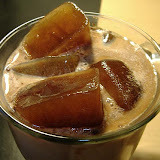 The coffee tree is actually a tall shrub, a member of the Rubiaceous family. Although there are about 60 different species, we're most acquainted with the two that dominate the coffee market: arabica and robusta. "The flowers of the coffee tree are white with 5 or 6 petals. The pistil that emerges from the cupule is tipped with delicate stigmas. The shape and scent resemble those of jasmine, and it is for this reason that the coffee tree was called "Arabian Jasmine" in the 17th century. The flowers form glomerules, or little tufts made up of 8 to 15 elements, at the base of the leaves. They produce the same number of berries, commonly known as cherries because of their colour. The flowers last only a few hours and wilt as soon as fertilisation has taken place: however, others quickly replace them. As a result, it is not uncommon to find leaves, flowers and berries on the tree at the same time! One tree can produce over 30,000 flowers in a year. " Interested in growing your own coffee at home? Check out this page. Here's an interesting note. Left Coast Kona, a coffee farm in Hawaii, plays music to their coffee trees. "Each tree is hand fed every few months and the mountainside is wired for sound to maintain tree mental health. The Left Coast trees seem to like Blues, with a taste of Country thrown in. They find the Beach Boys to be, well, a bit passé." Huh. Who'd a thought it. Coffee tree music snobs. Looking through my family recipes, it suddenly occurs to me we have some kind of cream cheese fetish. There are more recipes made with cream cheese than anything else. This is one of my favorites, but not one I make often. I needs a very special occasion. 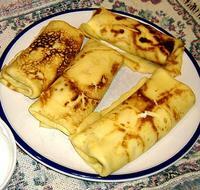 A blintz is basically a crepe (very thin pancake) filled with some kind of cheese filling. This is the recipe my mom used for many a morning brunch, and her blintzes were always a big hit. 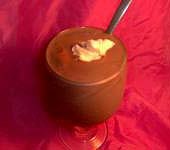 The recipe can be easily modified for a low fat meal. Beat together eggs, milk and oil. Add flour and salt and beat until smooth. Mix together, a little lumpy is ok. Coat a medium hot frying pan with butter (or Pam for low fat meals). Using a ladle, pour batter into pan. I usually pour a circle, count to 3, and then pour in the center. This allows the outside to cook a little and keep the insides from oozing all over the pan. Cook both sides a few minutes and set aside. Spoon 2-3 tbsp of filling mixture into center, and fold the sides in, fold the top down, then roll up from the bottom, just like a burrito. Set aside - you can put them in a warm oven to keep until you're ready to serve. You will find yourself getting into a rhythm ... pour batter into pan, and while that one is frying, do the fill-and-wrap of the other. This recipe will make 6-8 large blintzes or 8-10 medium. Serve with topping of your choice. UPDATE: Apologies!! I left out the flour in the ingredients list the first time around. Bad Christine. UPDATE #2: The Carnival of the Recipes is up at Beth's. This is the first Carnival of the 2nd year, kind of a landmark. Happy birdies! Oy! I wish I'd known about this one a month ago. Is My Blog Burning does a recipe roundup similar to the Carnival of the Recipes, and July's roundup (their 17th) was a tasty collection of recipes, all made with tea. Now, I've done some cooking with tea, but this is the most amazing collection of recipes I've ever seen. Hooboy! It's going to take me a while to go through these and try them out. I think I'll start with Chai Tea Apple Bread, shown in the photo here. It sounds like it would be perfect for afternoon tea, or morning brunch.